What is Computer Science and Language? The Computer Science and Language (CSL) degree combines computer science with the mastery of a particular language (French, German or Irish) and with the study of linguistics, which is the scientific study of language in general and the associated technologies concerning language. The chosen language (French, German or Irish) is studied to degree level, with emphasis on aural, oral and written fluency. This course develops a unique combination of skills – technical, mathematical, analytical and communicative. In doing so, it provides two of the most sought after skills today: degree-level fluency in a second language and a degree in computing, opening up hosts of future career possibilities. Many of these careers also involve the third degree-level strand of the course – linguistics. Predictive text in telephones, automatic speech recognition in directory enquiries, and machine translation are just three examples of technologies that derive from computational linguistics; countless others are on the horizon. Computer Science and Language: The course for you? This course will appeal to students with strengths in analytical reasoning and an affinity for mastering languages, but who do not want to choose between arts and sciences. While the course involves the study of mathematics and computing, linguistics and language, students are afforded considerable flexibility in their course options. If you enjoy mathematics, languages and problem-solving and are interested in combining topics in creative and insightful ways, then this may be the right course for you. This degree is one of the most interdisciplinary on offer, bridging both computer science and the arts. The skills acquired in the study of computing, together with the study of language and linguistics, open doors to world mobility and employability. Since the course began in 1985, graduates have moved on to careers that reflect the range of topics within the degree. Graduates will be qualified to work as language specialists, information technologists or software specialists in any of the IT, banking, translation, publishing or multi-media sectors. A number work as software engineers in international consulting firms. Some have embarked on careers in professional translation; others have moved into primary and secondary-level education. About 65% of graduates work in software engineering (whether in a mainly English speaking country or in a country where the language of the degree focus is the primary language); about 25% pursue research careers. A number of graduates now hold academic staff positions in Ireland and abroad. Another 10% tend towards a focus in technical translation. Some graduates have taken up employment in government service, e.g. the European Patent Office and the Irish Diplomatic Corps. In the first two years, you will study computer science, linguistics and your chosen language. The final year offers students the opportunity to explore in greater depth areas where computers and language meet or in the classical core of the constituent disciplines: computer science, linguistics and a language. Students complete increasingly complex projects in each year of the programme. Subjects that you study in the first two years of your degree will be continued in your third and fourth years either at Trinity or abroad under the Erasmus programme. In the fourth year, you will be able to take advanced modules in interdisciplinary areas such as artificial intelligence, information systems, computer processing of human language and the analysis and synthesis of the human voice. You also proceed to advanced study in your chosen language, perfecting both your oral skills and written skills in translation and essay writing. Optional modules and a major interdisciplinary Capstone project allow you to specialise in areas you particularly enjoy and to shape the degree around your individual strengths. 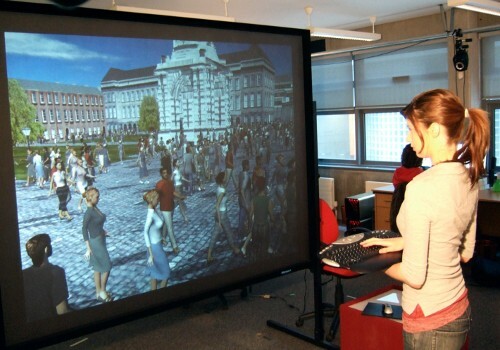 Examples of final-year module options include Computer Graphics, Machine Vision, Advanced Computational Linguistics (involving Speech Recognition and Machine Translation), Fuzzy Logic, and Human Second-Language Acquisition. Written examinations, course work and projects are all used in assessment. You will also complete a final-year dissertation as part of the degree. Students who study French or German will spend the third year studying at a university abroad and for students studying Irish, it is a possibility. Studying abroad gives students the opportunity to develop language skills and experience university life in another country. It also provides options for students to define their own specialist areas within the programme. Students choose one language from French, German and Irish. Students must present one of the above grades in their chosen language.